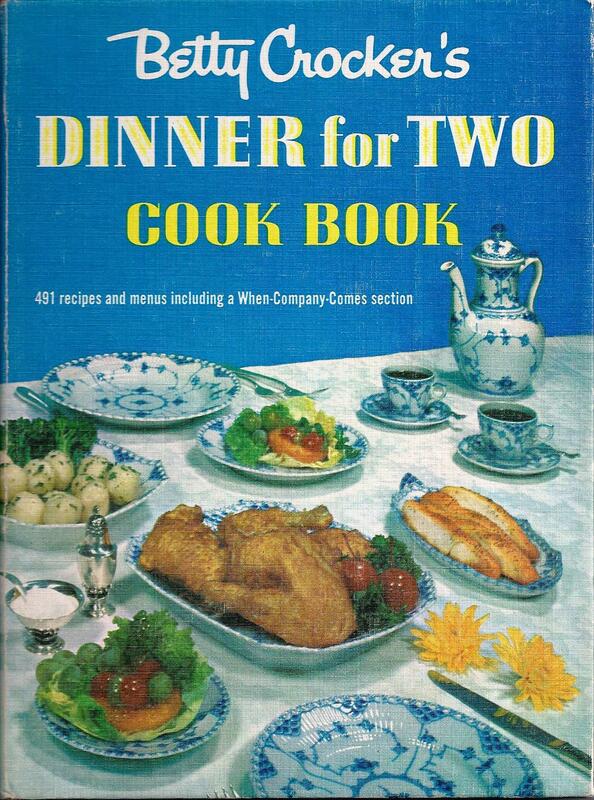 Betty Crocker’s Dinner for Two Cook Book was published in 1958…I was still in high school. I don’t think I purchased this book until the 70’s, when I probably picked it up at a book or yard sale. My copy is, however, very well used by now, the pages getting a little brown around the edges. Both Myrna and I love this book because the portions are sensibly small, the recipes are varied, don’t use many convenience foods, and allow for leftovers only where “cooking once to serve twice” seems desirable. This book covers the basics like making coffee, gravy, pie crust and biscuits, and “reputation” recipes that they thought everyone should master, like green salads, broiling steaks and hamburgers, fried chicken, roast pork and mashed potatoes. They also have chapters on holiday and special occasion meals, budget meals, regional and international recipes and outdoor dinners. They cover shopping, setting up a kitchen and setting the table. What I especially like is the format, which starts with menus and then gives the recipes. When I need some help with some menu ideas, I check this book. Many of my regular, every day recipes have come from this book or several other books from the same series, Good and Easy Cook Book 1954, Guide to Easy Entertaining 1959, and Cooking Calendar 1962. Myrna and I still found plenty of recipes to try. Cookbooks such as the ones you mentioned above were faithful friends in Mom's kitchen, Sue. I still have most of her oldest ones, including one published by WMT radio, featuring recipes from all over their listening area. There are a number of copies in "good" condition, used for around $7 including shipping on Amazon.com. Those are the same spiral bound copies we have, maybe in better condition than mine. If you have any big book sales in your area you may find one cheaper.